CCTV video splitters come in many shapes, sizes, and varieties. In this article we'll take a look at some different types of CCTV video splitters and explore how they are used. CCTV video splitters can actually perform several different tasks however their primary function is to split one outgoing video signal into two. By using a CCTV video splitter you can take one outgoing video signal and hook it up to play on two different monitors at the same time. Generally speaking, there are about three different categories of CCTV video splitters. They may be in the form of a simple cable, balun, or even an amplifier. CCTV video splitters come in many shapes, sizes, and varieties. In this article we’ll take a look at some different types of CCTV video splitters and explore how they are used. CCTV video splitters can actually perform several different tasks however their primary function is to split one outgoing video signal into two. By using a CCTV video splitter you can take one outgoing video signal and hook it up to play on two different monitors at the same time. Generally speaking, there are about three different categories of CCTV video splitters. They may be in the form of a simple cable, balun, or even an amplifier. 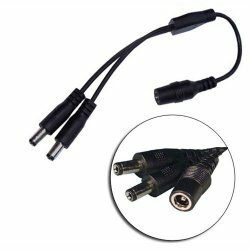 A cable type of CCTV video splitter is basically nothing more than a cable that is made with one end of the cable splitting into two, similar to the letter “Y.” These may work well for short runs of cable; however by splitting one input into two outputs the video signal through each will be weakened without an amplifier or other device to maintain the original signal strength. However, as mentioned above for short runs of output cable this is likely not to cause any signal degradation to each monitor. Every situation is different and sometimes the only way to find out if a certain arrangement will work is by trial and error. Another method of splitting the video signal is to use a balun designed for this purpose. Although a balun is really a specific type of transformer that can convert electrical signals that are balance about ground (also known as differential) to signals that are unbalanced (single ended) and vice versa. The name “Balun” comes from two words, BAL(ance) and UN(balance). In theory, using a passive balun to change the cable type from RG59 to Cat5E may also provide a means of splitting the video signal. Why would you want to do this? Because using a passive video balun, the signal can be changed at the connection source from RG59 to CaT5E. This is done because Cat5E is less expensive for one thing, secondly it’s easy to pull when installing it, it’s generally less expensive than RG59, and a passive video balun and Cat5E can carry a signal further than RG59 cable, usually about 1,000 to 1,200 feet. Most of the amplifier/splitters perform the same task; however individual units may contain extra and different features that can prove to be useful such as gain control, white balance, etc. There is another type of CCTV video splitter that we should mention as well. In essence, this device works just the opposite of what we have previously described above; instead of taking one signal and splitting it into two signals that can be viewed on two separate monitors, it takes several camera inputs and outputs only one signal, but “splits” each camera to a designated amount of space on the monitor. For example, a splitter of this type may accept 4 input cameras signals, each of course on their own channel. These enter the splitter but the signal that exits the splitter is only for one monitor. The splitter takes the incoming signals in this case and divides the monitor into fourths. Each of the cameras have one fourth of the monitor screen and all four cameras can be outputting to the splitter at the same time. What ever method you use, be sure to think it through before you design your system using splitters. There may be better ways to achieve your desired results or the CCTV video splitter might be the very best solution. If you need help with your CCTV video splitter or planning your system contact one of our security experts. They can be reached by using our “Live Chat” feature or by calling us at 1-866-573-8878 Monday through Friday 9AM to 6PM EST.